To use portable devices such as digital camera, wireless headphone, pocket radio, etc, which they operates with two "AAA" size batteries, using rechargeable Ni-Cd batteries is a conscionable way to reduce cost. Above circuit has been designed to charge automatically two series 350mAh "AAA" size batteries. Set the 20KOhms multi turn potentiometer to get a 2.78V on the 3rd pin of LM311. It is a comparator, when net voltage of batteries reach to 2.81V, the output of the LM311 goes high then the transistor will be off and charging operation will be halted. When the red LED is on indicates the charging is in the progress, when it is off indicates the charging has been completed. 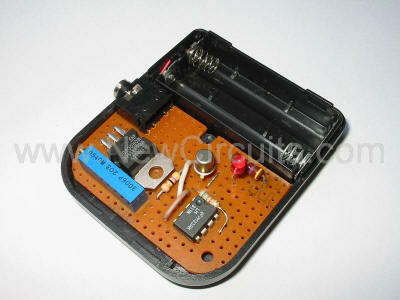 Ni-Cd Battery Auto Charger electronic circuit. Power electronic circuits and schematics.